How can I adapt the corner pergola plans to fit my space and allow me to grow climbing plants? Thank you for your prompt response. I have attached pictures of my garden. I am looking to buy/construct a corner pergola. As you can see I have hedges as my boundary. I would like the pergola to be right up against the hedges. 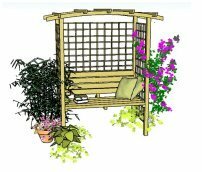 However I would have really liked trellis panels at the back of the pergola but I have no space to plant my corner pergola climbing plants. The only space I have for a trellis is at the left hand side of the bedding where it joins the circular paving. At the other end is a water feature and I would like to plant a tree at the back of the cascade to provide privacy from on-looking neighbours. I would like the pergola to grow climbers and ramblers. I am not sure if I can get them to grow at the top of pergola as I don’t know where to put any trellis. How would it be supported? I want an L- shaped wicker sofa up against the pergola and want the entrance of the pergola to be open. The main thing that stands out for me when looking at the layout of the area is the fact that you need to be able to cut the hedge! Therefore trellis isn't really an option. This isn't too much of a problem, although you need to plant your corner pergola climbing plants in the correct place depending on the type of climbers: some are fine growing in pots; others are not, for example, the more vigorous ones, and those with deeper and wider spreading roots. 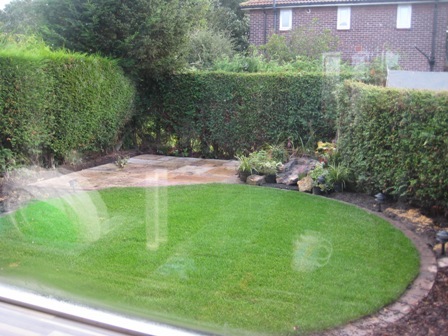 Have your main (more vigorous) plant in the border by the curve. This might be a climbing or rambler rose for example. 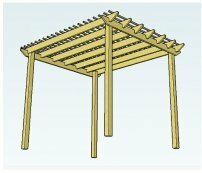 (If you built the pergola from the corner pergola plans then you could have trellis on the small side entrances). 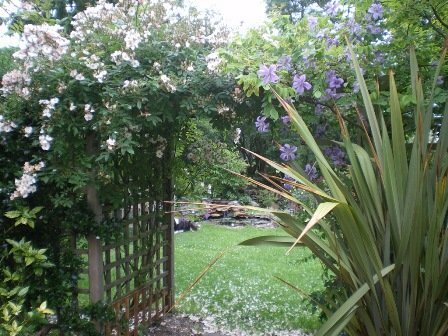 Here is an example of a fairly vigorous rambler rose on the left. Then use the actual posts as supports for less vigorous plants such as clematis, which can be planted in large pots. These can be under-planted at the base with trailing rockery plants or annual bedding plants, which will keep the roots of the clematis cool. If planting in pots make sure your climbers are well watered and fed. However you construct your pergola - self build or with a pergola kit - think carefully about how and where you are going to fix the posts. There may be enough room to sink posts into the ground outside of the paving. If not, make sure you order bolt-down post anchors, which are bolted onto the paving itself. Be very careful about planting trees in a garden - they will deprive other plants of water and nutrients, block out your light and maybe even disturb the foundations of your house and drainage systems (certainly your water feature!). If you decide you really need to plant a tree, make sure it is a true miniature variety (but then will it increase your privacy?) And even then it will do all of the above, just not quite as much as a full sized tree. 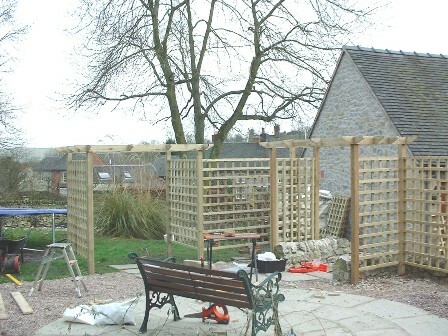 Trellis and pergolas surround the whole of this patio giving it the privacy it needs. 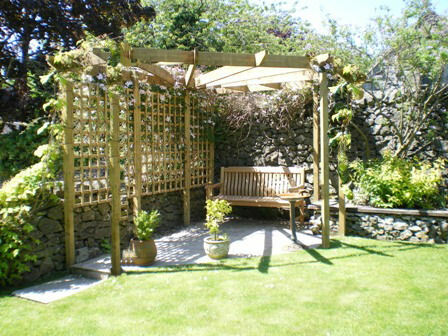 Notice how the trellis is joined onto the pergola posts...and very effective it is too. 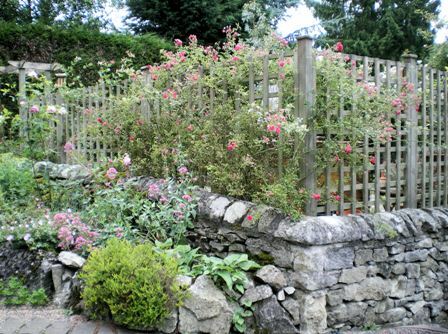 Here it is from another direction, with a deep pink rambler rose growing through the trellis. The L-shaped sofa sounds great. Garden furniture can make such a difference to the overall look of a pergola! You have been a star! I will defo send a picture when it’s complete. 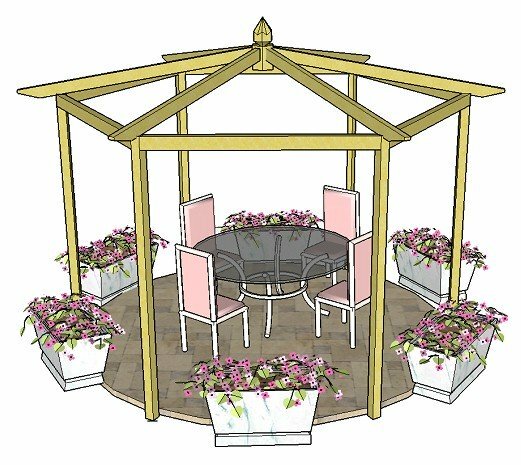 Here are some more corner pergola climbing plants growing over a pergola made from the step-by-step Corner Pergola Plans.